Well if you are a blogger or Webmaster , you must be aware of Copyscape , a useful tool to find out duplicate or Copied Content. However Copyscape allows you a limited number of Content Checking ( 10 - 15 times )for a particular website or Blog. After that you won't be able to use copyscape and Find Duplicate content for a particular website. 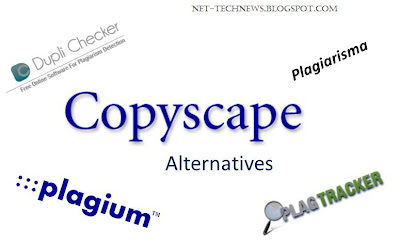 One alternative is Using Copyscape Premium that charges 5 c per search. Well this service is very much useful and if you have some money to spare , you can go for Copyscape premium to monitor plagiarism. In this Post , i'll be listing some of the alternatives to Copyscape for detecting whether a Particular content is Original /Unique or Copied / Duplicate . Plagium : Plagium allows you to Check Duplicate Content by Pasting text up to 25000 characters .Plagium is absolutely free and efficient Service. It is one of the Useful tool to check a Particular Post whether it is Original or not. I personally use Plagium to check Duplicate Content while reviewing Guest Posts. Unicheck : This is very handy and reliable tool for checking plagiarism online.Just upload your doc or paste the content and check the uniqueness in seconds. Plagiarisma : It is another free tool to check Duplicate Content , you can enter the text as well Paste URL to check the Duplicate Content. You need to register to Use this service. DupliChecker : It allows you to paste Text of up to 2000 words and it is a very fast tool to check plagiarism. Also they allows you to upload content to be checked and like above two this service is also free. PlagTracker : This is also useful tool , just Insert your Text to be checked and click on Submit Checking and it will process your submitted text and show you report for your Content. It is awesome tool and recommended. DustBall : It works like the above websites . Similar tool : just cut and paste the content to be Checked and it will tell you the reports for the same. Also you can upload .doc and premium account offers much more powerful detection.